Our second item is the bright patterned fashions by Katherine Way. We met Katherine last year and loved her clothing line so much that we wanted to re-introduce her to our readers and bring her back as one of our favorites! Katherine showed us one of the new styles that we absolutely adored. 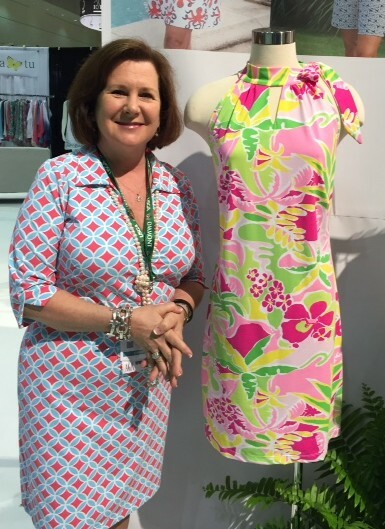 It’s called “The Jackie Dress” named after the iconic fashionista Jackie O. (This is not the style pictured above.) We know you’ll agree that Katherine’s line is beautiful! We can’t get enough of the Imperial products. (Their visors are our favorites!) Last year, they were showing a new technology built into their product’s fabric, which provides a cooling sensation. In keeping up with this cutting-edge technology, they now include this cooling feature in several of their lines of hats. This isn’t a spray that can be washed off. Instead, it’s built into the fabric. At this year’s show, Imperial presented their new towel line, which is small, lightweight, and washable. This patented technology claims to reduce surface temperature by 30 percent when the towel is wet. 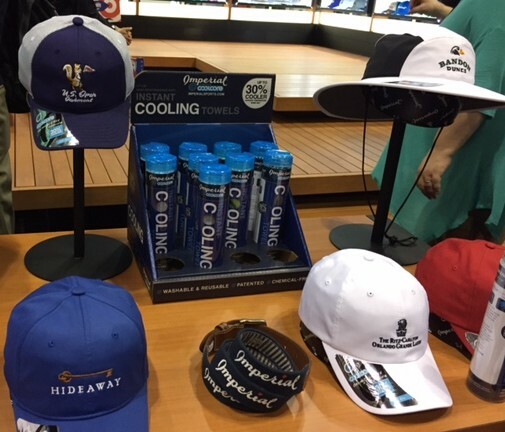 The towel is definitely a favorite on our list and a winner on those hot summer golf days on the course! What a delight it was for us to meet one of the designers (Alison Zipkin) and her parents in front of the EP Pro booth! 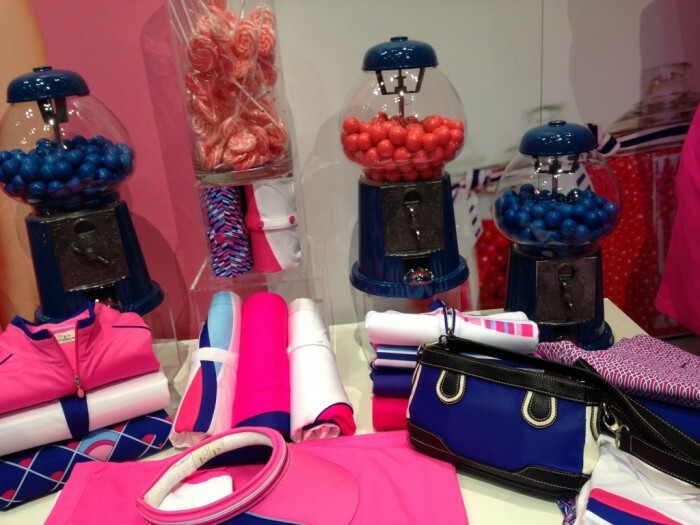 We loved many of their collection items, and they match perfectly with our Savvy Girl Golf purses—especially their Sugar Rush collection. We couldn’t resist putting a Birdie purse on the display! We love all the matching tops, skirts, jackets, hats, socks and sweaters. It’s just too bad we rarely see all these matching pieces in stores. They are even making tops one inch longer, so no more unwanted cracks at the course. Our next item, is the Golf Bike. 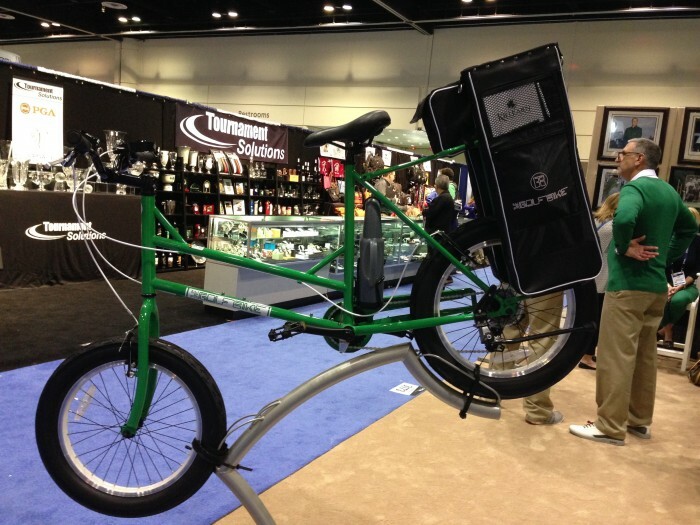 (Check it out at www.thegolfbike.com.) 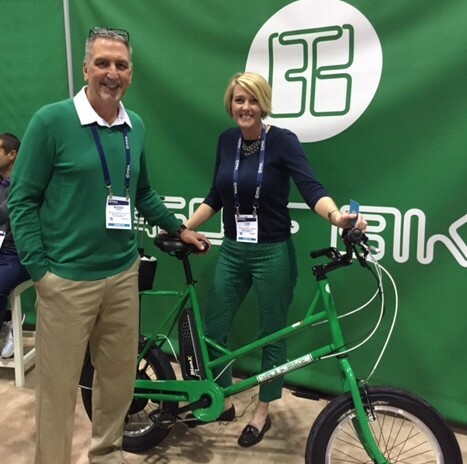 The bike was invented by Todd May who states that “with the golf bike, I have combined the benefits of each, bringing the elements of fun, fitness, and speed of play to the greatest game ever played.” The Golf bike was launched in 2014 after 5 years of prototyping and testing. Time will tell if this will be embraced by golfers, but we’re sure that it’s worthy of mention as a unique item at the PGA show. 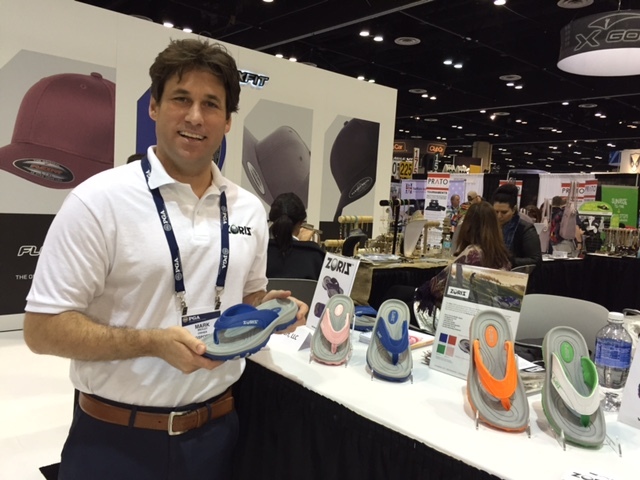 Zoriz’s brand of men and women’s golf flip-flops was a new item at the show this year. These unique flip-flops will be available on June 1, 2016. They are specifically designed for golf and are attractive and waterproof. We were told that the sizing runs a little large, which is something to keep in mind if you’re ordering them online. They will be available in 4 attractive colors in both men and women’s sizes. 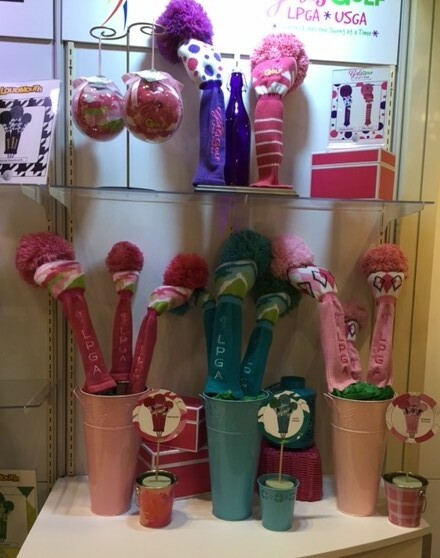 Just4Golf was at the show with the most creative line of knit headcovers that also featured pom poms. We loved all their bright colors, polka dots, stripes, and the fantastic quality of each material. The driver headcover can be customized with embroidery. Woods and hybrids are differentiated with alternating patterns and adjustable sliders tell the club number. It might be hard to imagine pretty headcovers, but somehow Just4Golf cleverly figured it out. 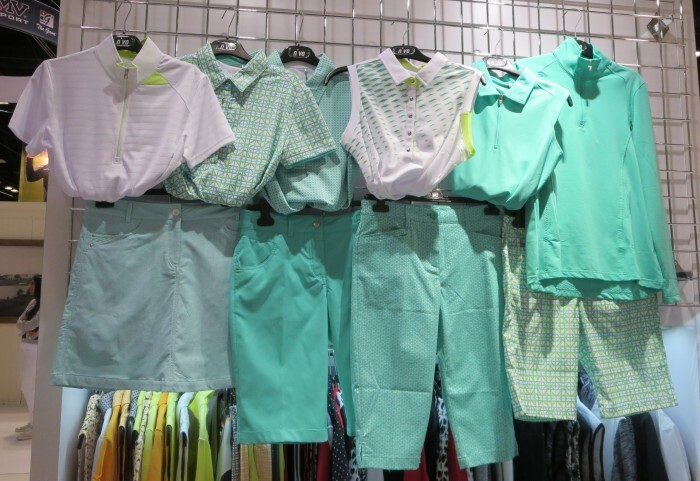 The Littlest Golfer Company was showing not only the cutest golf clothes for children, but also their line of books and accessories. 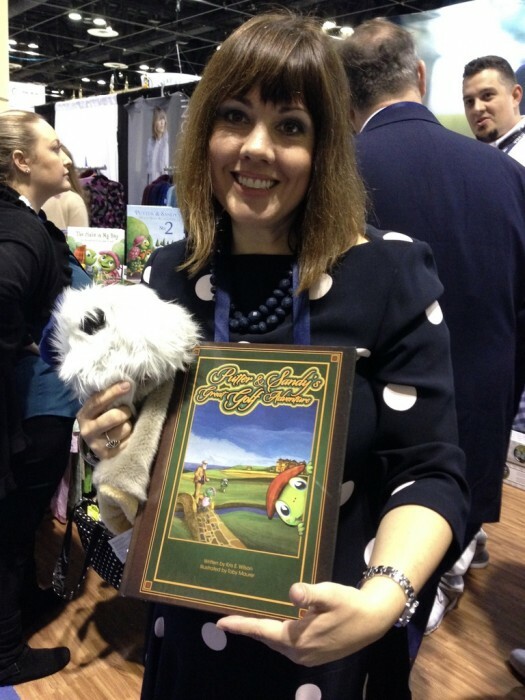 The books feature two turtle-like characters named Putter and Sandy, who teach kids about golf. 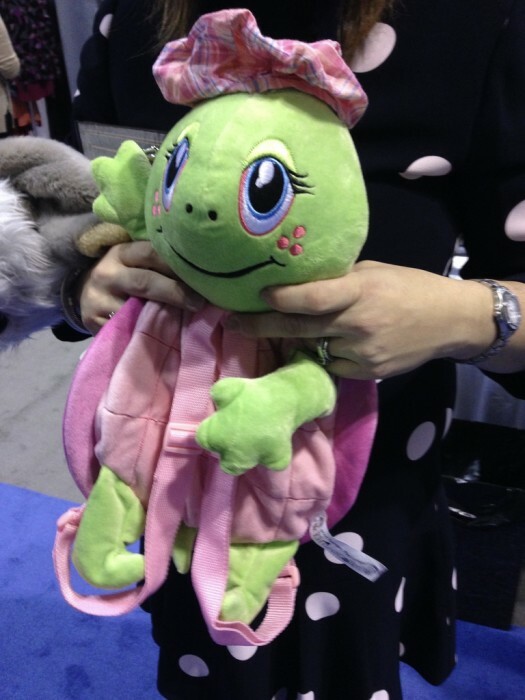 We loved their headcover and backpacks too! 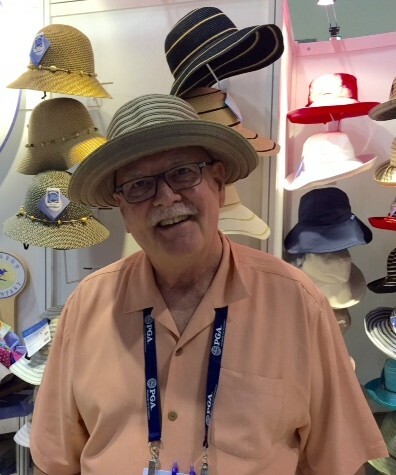 We found this stylish golf t-shirt and hat combo at Ahead USA and had to include it in our favorite things list. These custom made items are only available online as part of the company’s “give away” rewards promotion and tee prizes. 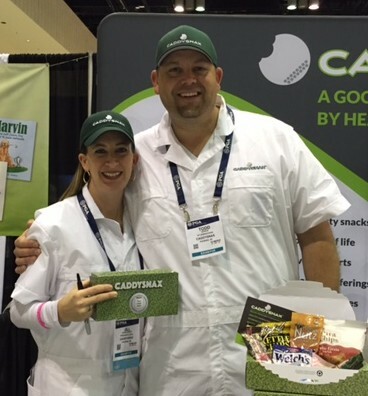 This sporty package includes a coordinating hat and t-shirt, both with the company or golf course’s logo on it. You’ll stay cool and focused on your game with this nifty combo. You may think that there aren’t many food promoters at the show, but there are. 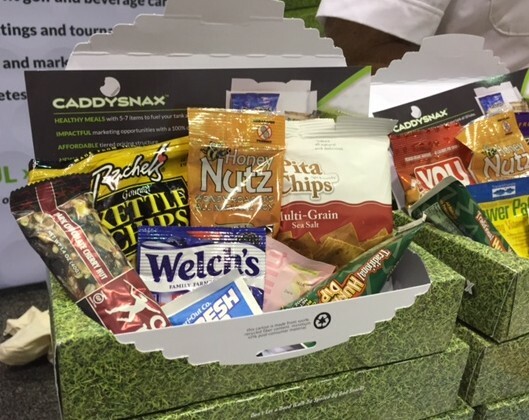 One company, Caddysnax sells a customizable snack pack with delicious munchies like hummus, chips, dried fruit, and nuts. BJ Viau from Fore Fun attended the event too, and offered a tasty salted nut roll, which promises to give you the energy to power through a round of golf. We like to carry one of these on the course because it’s packed with protein, and it tastes great. BJ was also pitching a book on games and golf tips which we loved! This is by far our favorite hat vendor every year. Robin and Sandy model the hats for us. (Doesn’t Robin look “cute” in the photo?) Sun protection is serious business for Wallaroo. That’s one reason we love them so much. But we also enjoy the unique designs they carry. 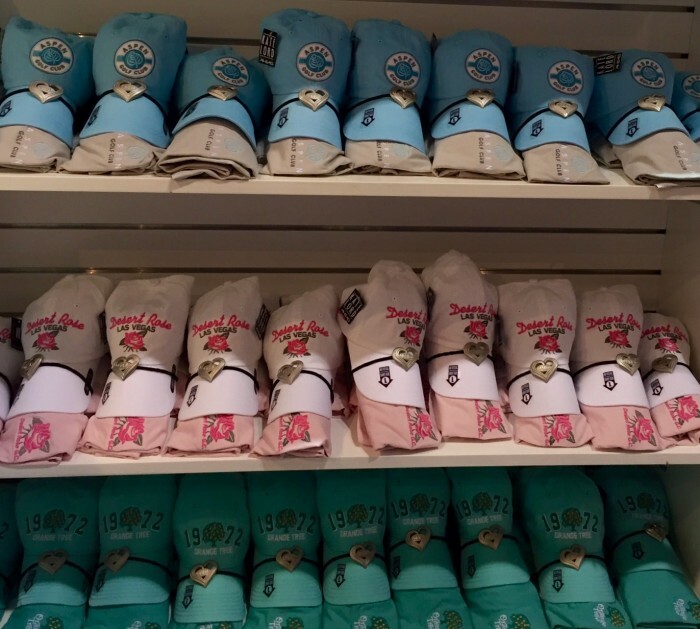 All hats are durable and most are “crushable,” which means they fold up for easy packing and can be tucked away inside your Signature golf purse or suitcase. And the best part—they look like new even after being stuffed in a bag for long periods of time! 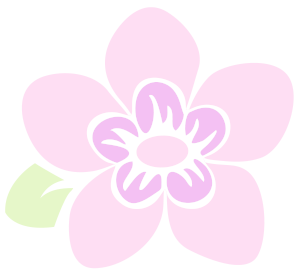 Our final item on the list is the iGolfrules’s app for your iPhone. The app is available on the iTunes App Store for $9.99. Once you install the app, you start your search by tapping on the area where your ball is located—on the tee, in the bunker, in a water hazard, etc. Next, you find the heading that best fits your situation, such as abnormal ground conditions or movable obstruction. Then, the app will provide you with more that 200 graphics and videos that will explain the correct step-by-step procedure that applies to your situation. This fun and functional golf favorite will help you stay on your game without skipping a beat. 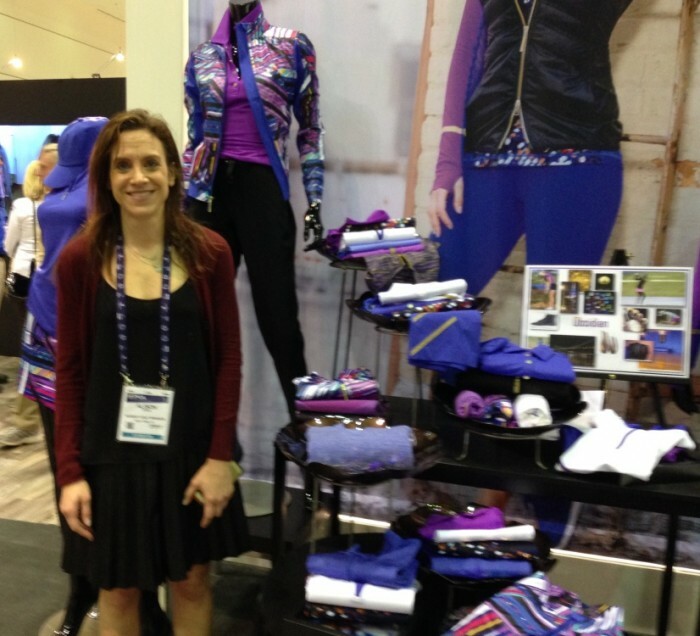 We had so much fun attending the 2016 PGA Merchandise show and visiting all the unique and creative vendors who, like us, work to design golf gear that is both fashionable and functional for the stylish golfer. We can’t wait for next years’ event. 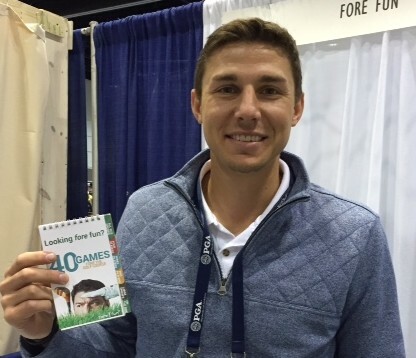 We’d like to end our favorites list by thanking all of our readers who helped us prepare for our trip to the PGA Merchandise Show. 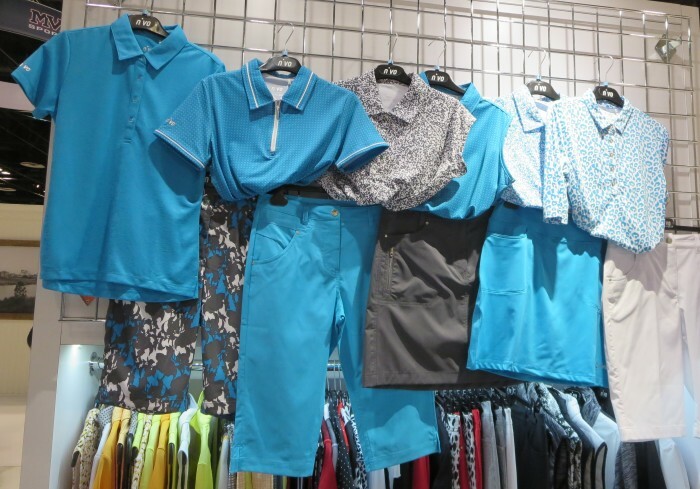 Your suggestions and comments helped inspire us t0 search for the perfect golf gear to match our Savvy Girl line. We hope you enjoyed reading this list as much as we loved making it. Will definitely be purchasing those flip flops for myself and a friend. The perfect list of golf items. My favorites are EP Pro, their collection items are amazing, gorgeous patterns and colors. I enjoyed reading your list of favorites. 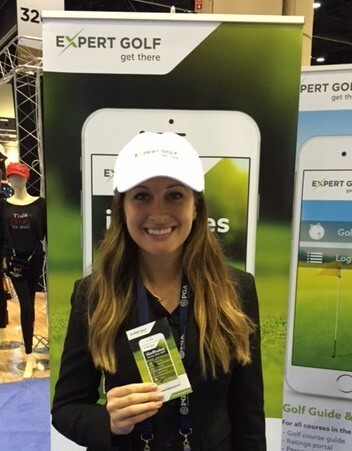 Attending the PGA show is on my bucket list. I wish they would have it in California some time. P.S. I liked the no cracks on the golf course, lol…!